Her Majesty has also been pleased to take into Her gracious consideration the many instance of gallantry displayed by Officers, seamen, and marines in the boat actions during the same period, and to direct, that such service, if distinguished by the promotion of the Officer conducting the enterprize, shall entitle those who were present, and now living, to a medal; provided the answers given in form (B) shall enable the Committee to ascertain that the claim is well founded. But the Officers, seamen, and marines of the ships, from which the boats were detached, are not to participate in a distinction which only properly belongs to those personally engaged. Almost invariably the Officer conducting the enterprize would have been a commissioned officer, but it is interesting to note that the clasps were reserved for those who actually participated in the boats, which makes NGS medals with these clasps especially attractive. One can be assured that every participant was in action, there were no passengers on these expeditions. They were essentially the equivalent of modern day commando/special forces actions. Typically the goal of the expedition was the ‘cutting-out’ or capture of an enemy vessel lying under the protection of a shore battery or some other fortification. The boarding party would normally consist of volunteers, armed with cutlasses, pistols and pikes who would set off in the boats under cover of darkness, most often approaching the enemy vessel from a distance. 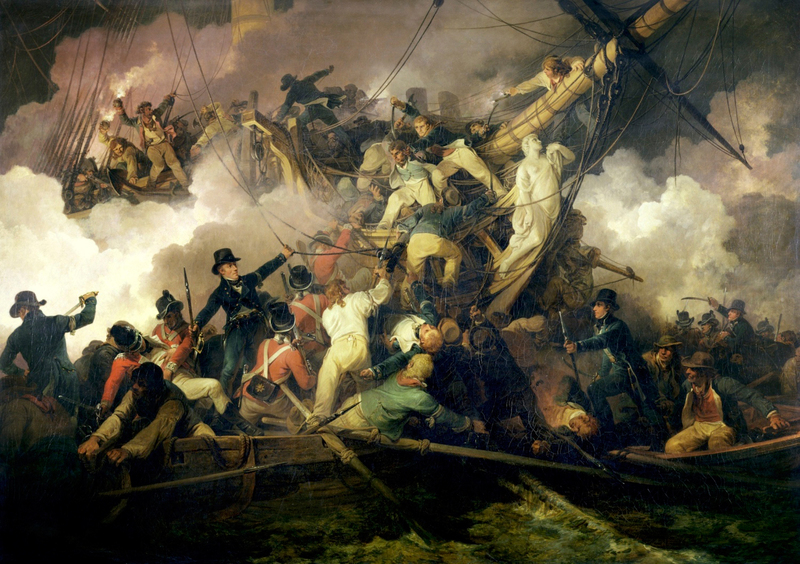 A spectacular painting by Philip de Loutherbourg (shown below) gives a vivid account of the tumults carnage of such endeavors. NGS Boat Service clasps, date and year engraved, the words Boat Service cast. There were a total of 55 approved actions, dating from the onset of hostilities in March 1793 to the final action in December 1814. The list was first published in the 26 January 1849 London Gazette. The text on the clasp was rather unassuming – but not unattractive, with just the the words Boat Service sandwiched in between the engraved date and year (see figure to the right). A table of the 55 approved actions is shown below, indicating the number of clasps issued (from ADM 171/3) and the number of ships supplying boats, as well as the approximate geographical location. Click twice on the heading in ‘Clasps Issued’ to sort by this column in descending order. As can be seen from the table, some clasps had no claimants (or at least none were approved), and almost half had fewer than ten issued. It is also interesting to see the comparatively fewer actions approved during the French Revolutionary war (1793-1802), with a total of nine, on average one per year. Compared to the the later Napoleonic war (1803-1815), with a total of 46, on average 3.8 per year. This may reflect the possibility there were fewer promotions for conspicuous service approved during the Revolutionary War, more so than fewer Boat Service enterprises taking place. Boat Service clasps on the medal to John Davies. Image courtesy of a descendant of Davies. A search of the online NGS 1793-1840 roll which is based on the Admiralty claimants lists ADM 171/1-3, reveals some interesting statistics. Of the ~18,000 medals issued there are only 965 containing one or more Boat Service clasps. Furthermore, 79 of these medals were issued with two and a mere five with three Boat Service clasps. There does not appear to be any medals with four or more clasps. The recipients of the five medals with three Boat Service clasps is shown in table 2 below. 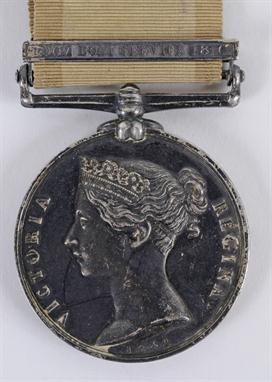 Clearly any medal with multiple Boat Service clasps should be considered scarce – if not rare, and even a single clasp medal is scarcer than a Trafalgar medal to put it in perspective. Of the five medals listed in table 2, only the one to John Davies is known. This name is not unique on the roll and one is clearly highly suspicious when such a rare medal surfaces. However, in this case it is known to resides with the family in Australia, and I have no doubts about it authenticity. It is also interesting to note that the entitlements of Davies and Roberts are identical, in fact it appears they lived identical lives, same ship and rank at the same time. The two first actions are both in the vicinity of Basque Roads off the west coast of France where clearly many cutting-out expeditions took place. Likewise, the medals to Bruce and Whisker spot the same Boat Service clasps, this time all taking place in the Adriatic and again the same ships. Only Farrant, a more senior officer saw action in several different places. The NGS medal issued to James Rennie, Master’s Mate aboard HMS Cerberus. The ‘8 June Boat Service 1810’ clasp is for an unlisted action in the Adriatic. Image courtesy of DNW. There are examples of medals issued with what appears to be a perfectly genuine Boat Service clasp, but it is not on the published list of the Admiralty approved actions from 1849. Such a medal surfaced a few years ago at DNW (Sale 19th June 2013, lot 332). It hammered for a cool £30,000. Another two are mentioned in Douglas-Morris’ Naval Medals 1793-1856 Ref. 2, where he goes into great detail on how to verify such an ‘unlisted’ clasp. Those medals are now held at the Royal Navy Museum in Portsmouth. Not surprisingly, all of these medals were issued to officers, who undoubtedly had a better chance at convincing the Admiralty of their proper entitlement, compared to lower deck ratings. It is of course not clear how many ‘unlisted’ claims were successfully argued with the Admiralty, but it must have been several, considering the number of such medals known. It is also worth noting, that the Admiralty never published an updated list of approved actions. This suggests that it was the individual officer’s arguments about his personal conduct at the action that convinced them it merited a ‘personal’ Boat Service clasp. Such medals are obviously highly desirable, which is reflected in the high price achieve at the DNW sale mentioned above. London Gazzette, 16 June 1848 issue. London Gazzette, 26 January 1849 issue. John Hayward, Diana Birch, and Richard Bishop, British Battles and Medals, 7th Edition, Spink 2007. K. J. Douglas-Morris, Naval Medals 1793-1856, London, Privately Printed, 1987, p. 131. Another excellent article Peter. The intricacies of the NGS really are quite something, with Boat Service clasps raising the bar ever higher. Such an intriguing medal covering incredible naval history. Every day I learn a little bit more. Thanks for all your great articles. A minor addition that may be of interest to other readers (I know you know already know about this one). Last year (Mar 2016) the 4 clasp medal to Captain George James Perceval “Trafalgar” “1 Nov Boat Service 1809” “4 April Boat Service 1812” “Algiers” (G.J. Perceval, Capt. R.N.) sold at local auction for £32000*. 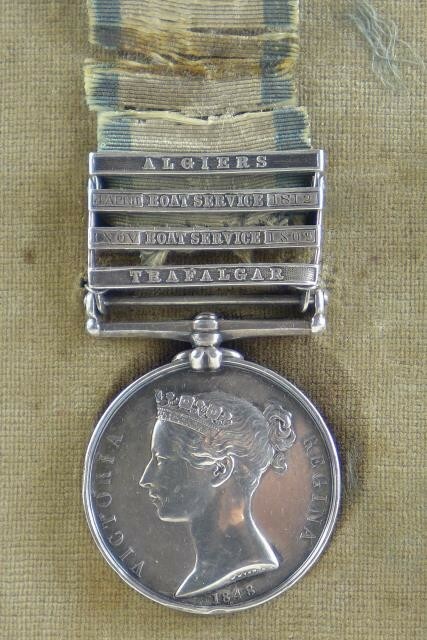 Fresh to market, the lot also included his Boulton’s Medal for Trafalgar. Perceval’s medal looked intact and unaltered from Lot photos. Letters he wrote, now with the National Maritime Museum, seem to confirm his presence at the action, as does his ADM. The interesting Boat Service correlation is that prior to this medal coming to market there were only 4 known issues of the rarer 4 April Boat Service 1809 clasp issued, this may be now a previously unrecorded fifth. None of the 4 earlier examples are seemingly known to be extant today. All adding to this Boat Service clasps overall rarity. Capture of the French xebec MARTINET, off Cape de Gatt, S.E. Spain. Thanks Dave for the kind words and the pointer to Perceval’s medal, very appropriate as you point out. Many officers were undoubtedly successful in proving their presence at some of these ‘obscure’ Boat Service actions, even after the official books were closed (or what is in ADM 171/3 – which is what we have on the roll). Clearly the numbers I quoted in the blog would have to be taken as approximate, since this is now among the two BS clasp medals. Thanks for you comment, much appreciated. Your article got me thinking about another rarer BS clasp that sold in the last few years. It is on your list but as it is only 1 of 1 thought I might mention it again on your comments section here. 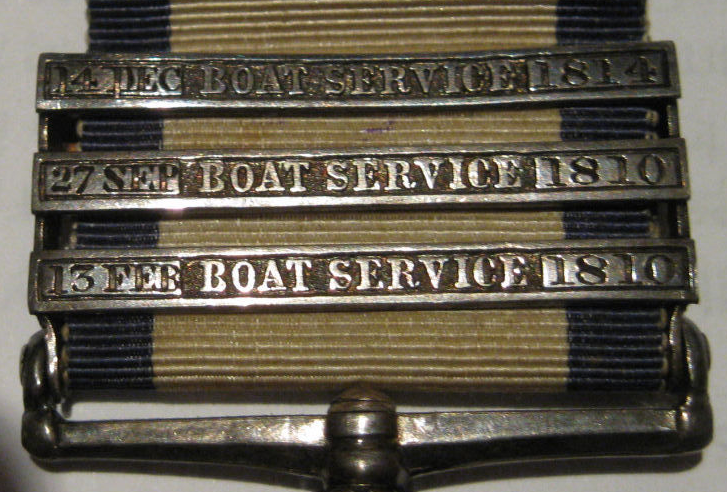 A BOAT ACTION NAVAL GENERAL SERVICE MEDAL. Bar to NGS,4th Nov Boat Service 1810 awarded to James Barrington whilst serving on HMS Blossom. It was on this occasion that the 18 gun sloop HMS Blossom was cruising off Cape Sicie under Captain William Stewart, chased a Latteen Xebec. Arriving within four miles of the Xebec, it fell calm. Captain Stewart dispatched the Cutter under Masters Mate Richard Hambly to reconnoitre the ship, charging him not to risk a single life should the ship be armed and ready to ‘Make obstinate resistance’. A second boat the yawl was launched and volunteers under Lt Samuel Davis and Midshipman John Marshall joined the cutter and the two boats pulled with all strength to over take the Xebec. At about 7pm just as the boats arrived within gunshot of the privateer, which was the Cesar of Barcelona carrying four guns and 59 men, fire was opened upon them. Killing Lt Davis and three seaman and badly wounding (by a musket ball through the collar bone) Mr Hambly together with another four men. With the remaining 26 seamen and the marines remained Midshipman Marshall sprang on board of and after a smart contest carried the privateer. Though not without the loss of five more men wounded. The privateers crew had four men killed and nine men wounded, the greater part after being boarded. The seven marines divided between the two boats only fired twice, before boarding and taking the ship. Despite the courageous exploits of Mr Marshall it was another six years before he received a Lieutenants commission. HMS Blossom was launched in 1806, she is listed as capturing three privateers during the Napoleonic War, the others being 15th Jan 1811 a French privateer Ceaser and on 23rd Feb 1812 a French privateer Jean Hart. Hammered for £19K in 2012. Would probably push upper £20’s now I would think? The images are gone now, but I kept a couple – one attached. Sorry for quality. Again, not every day a 1 of 1 comes up for sale. Someone – not me – got a nice little addition to their collection! Thanks Dave – and yes, they do not get any more rare that that. I do remember this one, and I agree it would most likely go for more today. 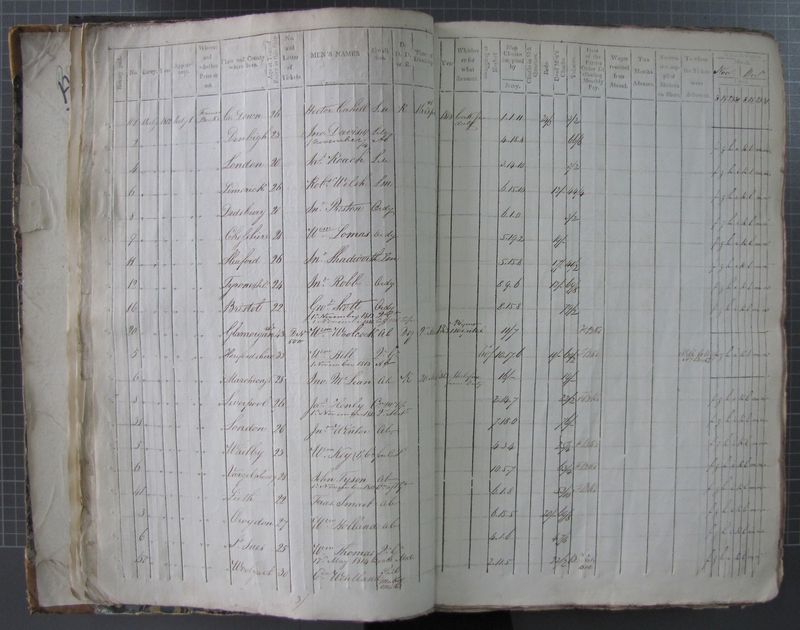 Thanks Russel, Interesting to note from the Muster Book, that Davies advanced from Landsman (L.M.) to Able Seaman (A.B.) – without the intermediate step of Ordinary Seaman. This almost certainly proves he had prior sea going experience. Thanks for posting.